For the eighth straight year, Summit County residents have voiced their concerns with employment issues according to the 2014 Summit Poll. Results from the Summit Poll show that although Summit County residents are still very concerned about employment issues such as not enough jobs and high unemployment rates, the percentage of respondents who cited employment issues as the most important problem facing the county drastically decreased from a high of 49% in 2010 to just 30% in 2014. At the same time, crime and safety concerns as well as economic concerns such as high taxes have declined from the previous year while infrastructure and government concerns such as road conditions and sewer systems have increased. The overall perception of the availability of job opportunities in the county has changed little from 2013. When asked to rate the availability of job opportunities in the county, a significant portion, 39%, continued to rate job opportunities as poor or very poor, though significantly less than 2009 to 2011 when negative ratings of job opportunities ranged from 51%-56%. 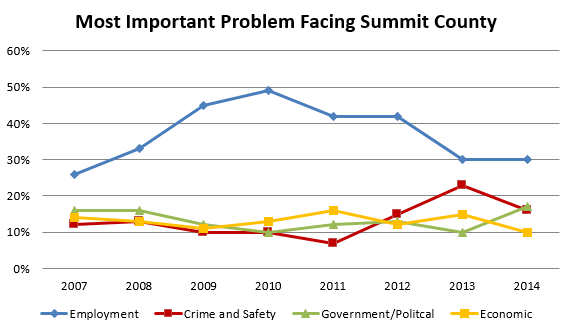 The data included in this Press Release is from the 2014 Summit Poll, comparison data from 2007-2013 is also included. The Summit Poll is an annual telephone survey offered to community organizations and local businesses as an affordable method of collecting information on opinions & attitudes of county residents. The Summit Poll includes questions posed by multiple organizations in which each participant purchases only those questions necessary to meet their information and research needs. The final sample of the 2013 poll consisted of a total of 800 respondents. The poll was conducted in March 2014. The general population statistics derived from the sample size provide a precision level of plus or minus 4% within a 95% confidence interval. The Center for Marketing and Opinion Research (CMOR) CMOR is an Akron-based public opinion research firm providing professional research services including telephone, web and mail surveys, field, intercept and key informant interviews as well as focus group administration.